FROM LEFT ARE Jody Christy, president, BOSS Snowplow; Bob Werner, president, Dickinson County Bike Path Committee; and Mike Groeneveld, vice president, operations, BOSS Snowplow and a Dickinson County Bike Path director. BOSS is ensuring Tour de Dickinson volunteers are visible along the route for Saturday’s event by providing high visibility vests. IRON MOUNTAIN – BOSS Snowplow, a division of The Toro Company, will help support the 12th annual Tour de Dickinson family bike ride schedule for 8 a.m. Saturday. 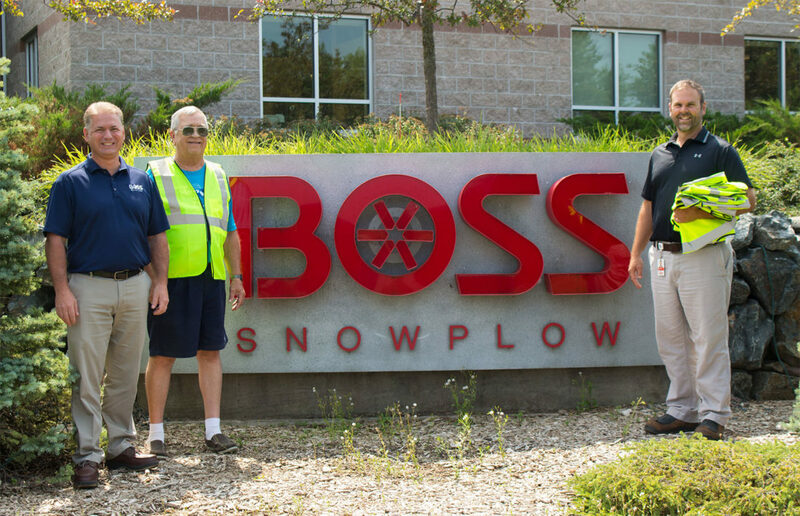 BOSS Snowplow is a financial contributor as well as a safety contributor, ensuring volunteers are visible to drivers along the route with high visibility vests. Riders from across the community and tourists from nearly 10 different states will participate and enjoy the amenities the area has to offer throughout the weekend, including Italian Fest, which takes place in conjunction with the race. All registered volunteers and riders receive a bracelet for free admission to the festival. The ride is coordinated by the Dickinson County Bike Path Committee, a group dedicated to creating a county-wide bike path. Those interested in supporting financially or with their donation of time are encouraged to contact Bob Werner at 906-779-9712. To sign up to participate in the race, go online to www.active.com or www.dcbikepath.org.